What is regenerative braking in variable frequency drives? To answer your first question, regenerative braking in variable frequency drives (VFD), the premise is that whenever a motor is rotating faster than the winding are excited the motor becomes a generator. Regenerative braking means the voltage produced is "placed somewhere else". Often the excess voltage can be absorbed by the IGBTs or the addition of a braking resistor...maybe even placed back on the AC power network. In some applications I've been involved with, particularly large rotating machines, DC bus over voltage faults can occur unless the deceleration time is extended. Now, whenever the rotor frequency of an induction motor is greater than the stator frequency the motor automatically becomes an induction generator. When this happens current will flow from the motor (now a generator) towards the utility grid rather than from the power grid to the motor. If you have a VFD as the controller for the motor usually they will have either a 3-phase, full-wave diode rectifier or a 3-phase, full-wave SCR bridge as the means to convert 3-Phase AC voltage to DC voltage that is filtered and stored in the DC bus capacitors. These devices block any current flow that may come from the motor (when it is regenerating) so the current flows into the DC bus capacitors. When this happens the voltage across the capacitor rises and could exceed the capacitor's voltage rating if left uncontrolled. This would let the magic smoke out of the capacitors, causing a variable frequency drive failure. To prevent this from happening most variable frequency drives have a DC bus voltage sensing circuit in their control scheme that would turn off the inverter output switches which would then interrupt the flow of current from the motor and the motor would essentially coast to a stop. 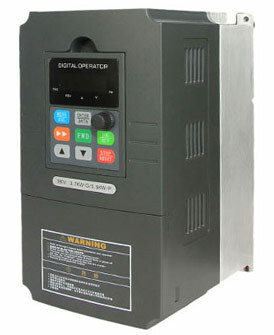 The variable frequency drive would likely display an "overvoltage" fault. In a hoist or crane application long deceleration is usually not an option. If it's a high load application with high repetition (like most hoists) there may be some trial and error as to what works best. I'm inclined to increase deceleration time and oversize the braking resistor BUT that's from afar - there may be mitigating circumstances.